Nothing symbolizes a cozy home more than a wood-burning fireplace. But no matter how carefully you maintain the fire, eventually some soot will escape the firebox and scatter onto the bricks of the surrounding facade and hearth. Soot is fine, black particulates that occur when any organic and carbon-filled materials are not burned completely. When you see the black streaks and stains, it's time to clean your fireplace bricks. When soot accumulates, it leaves the odor of smoke and unsightly black stains on bricks, ceramic tiles and grout, carpets, drapes and upholstery, and painted surfaces. It's important to remove the soot often because it can eventually cause permanent damage, especially to porous surfaces. The more often you use a fireplace, the more often you'll need to schedule a time to clean. 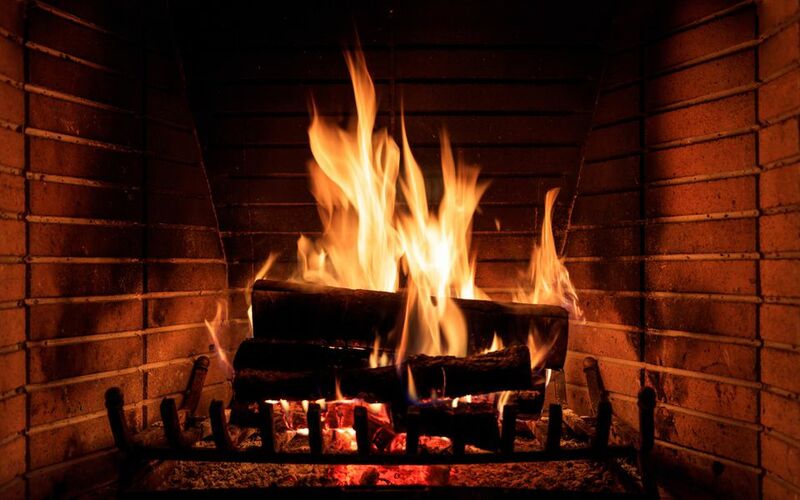 The sooner you clean away soot discoloration on fireplace bricks, the easier the job will be. There are several cleaning solutions that you can use to clean your fireplace. With each method, there are several steps you should take before you begin the actual cleaning, which will help remove soot and protect surfaces before you get down to the actual scrubbing. Start with a cold fireplace. Remove the andirons, grate, and all of the ashes and debris in the firebox. After disposing of the ashes safely, use a shop vacuum to gather up any small particles. Vacuum the hearth and fireplace surround to remove as much soot and dust as possible. Clear the mantle of any decorative items to prevent excessive dust from settling on them, as well. Grab a waterproof drop cloth to protect carpets and floors from spills and stains. This is the mildest cleaning method and should be tried first before moving on to more harsh chemicals. Pour one gallon of warm water and two tablespoons of a good dishwashing liquid with grease cutters into one bucket. Fill the second bucket with one gallon of cool water and add one cup distilled white vinegar. Fill the spray bottle with plain water and spritz the stained areas. You may want to work in small areas at a time to prevent the brick from drying out. Dip the scrub brush into the dishwashing liquid solution and then sprinkle the brush liberally with table salt. The salt will act as a mild abrasive to loosen the soot from the brick. Now, use some elbow grease and scrub the sooty areas. Use one sponge to wipe away the cleaning solution and loosened soot. Dip the second sponge in the water and vinegar solution and wipe down the cleaned area. The vinegar will help remove any soapy residue and dispel smoky odors. Repeat these steps until the entire area is soot free. Once the soot is removed, you may discover some rust stains left from metal fireplace accessories. Removing these stains requires the use of oxalic acid. Follow product directions carefully. If the dishwashing soap and salt won't remove the soot, up your game by adding one-fourth to one-half cup of household ammonia to your cleaning solution. Instead of table salt, purchase fine-ground powdered pumice to sprinkle on your scrubbing brush. Follow the same steps listed above and be sure that your room is well-ventilated because ammonia fumes can be powerful. Is your fireplace particularly dirty? Try this next method to tackle the most stubborn soot stains. Trisodium phosphate is a powerful cleaner and will remove the toughest soot stains on fireplace brick. However, TSP is highly toxic and must be used with care. Full protective gear like rubber gloves, eye protection, a respiratory mask, a long-sleeved shirt, and long pants are required. Since you will be using it inside, the area must be well-ventilated. TSP can also damage ceramic tile, metal, fabrics, carpets, and painted and finished surfaces. Mix one gallon of hot water and eight tablespoons (one-half cup) of TSP in a bucket. Fill the second bucket with plain cool water. Dip the scrub brush in the TSP solution and apply some elbow grease to the stained areas. Do not allow the solution to come in contact with your skin. Use a damp sponge to wipe away the cleaning solution and soot. Finish by dipping the clean second sponge in the plain water for a final rinse. If the soot is not removed, repeat the steps. You can use up to one cup of TSP per gallon of hot water if needed. Since TSP is toxic to the environment and will damage plants, contact your local municipality for information on proper disposal. Enjoy your newly cleaned fireplace on the next cold night!